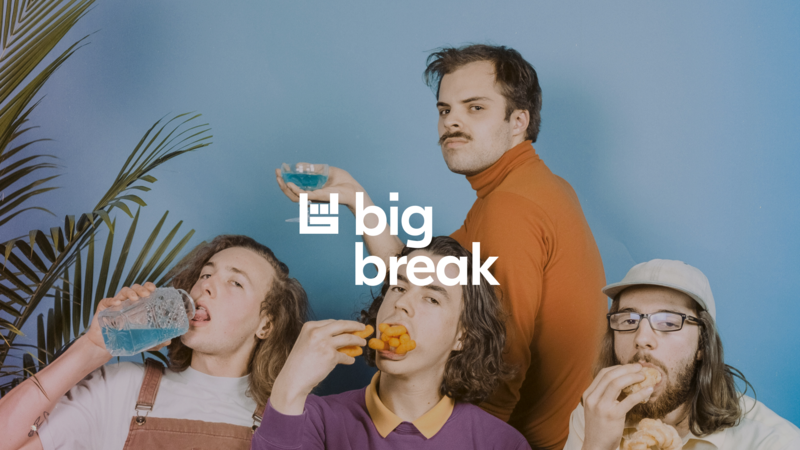 Bummer summer vibes come complimentary with Peach Pit’s collection of sweet, mellow indie-pop tracks. A perfect blend of teenage angst and the golden rays of the last days of summer vacation, the Vancouver foursome's music hits all the right notes of adolescent aches and pains. Just sample "Seventeen" or "Sweet F.A." off the band’s first EP, released in 2016, for a taste of what the boys aptly call "chewed bubblegum pop". Now, with a newly pressed debut album, Being So Normal, under their belt, the band is ready to steal hearts, minds, airwaves, and stages everywhere. Next month, the guys will be taking to the road with their live act—where their bittersweet renditions meet uniform ensembles—playing a few west coast shows before embarking on a European tour early next year. Before you meet them onstage, get acquainted with the quartet via our chat with bassist Peter Wilton, then check out their Tour Bus Playlist below! LOVE Being So Normal—the album has a perfect end-of-summer feel in both sound and lyrical content. What was the songwriting process like? Thanks. Basically the songwriting process goes like this: Neil (Smith - guitarist and vocalist) writes a chord progression/melody/lyrics, and brings it to the rest of the band to tweak and arrange. Mikey (Pascuzzi - drummer) and I figure out how to hold it down and Chris (Vanderkooy - guitarist) writes a catchy lick at which point the song really starts to piece itself together. Being So Normal was a result of this over the past three years. How do you think this album has evolved creatively from your debut EP, Sweet F.A.? I think Sweet F.A. is overall a pretty bright and poppy record whereas Being So Normal goes from grungy pop to sad ballads and everything in between. It's a pretty versatile album, and I think it really showcases all the different styles we like to dip into. How do you guys set the mood in the studio when you’re recording? And what’s your favorite memory you have of recording Being So Normal? We recorded Being So Normal in The Space Studios in Vancouver, B.C. It's a small cozy studio that's pretty much designed to look and feel like a living room so the mood sort of sets itself in a way. It kinda feels like you’re going home to drink some coffee and hang out and play music. I think the favorite memory of recording the album was when we all decided that being naked while recording would allow us to become one with the songs. Didn't work, maybe next album! Your outfits are everything. What are your favorite places to shop in Vancouver and when you’re on tour? We actually love shopping at thrift stores; it's pretty much the only place we shop. Value Village is where we got our outfits, which is scary because we only have one of each so losing them is not okay. Mikey lucked out though: turns out yellow dress shirts are super easy to find, which is perfect because he rips his shirt off at pretty much every show. His girlfriend has stayed up until 6 a.m. sewing his buttons back on so he didn't have to buy a new one. Do you remember the first Peach Pit show? What was that performance like? Our first ever show was actually a benefit concert at a church in front of 200 people and we all wore suits. We played “Peach Pit”, “Seventeen”, and “Alrighty Aphrodite”. At the time we thought we played a pretty killer show but I feel like our present selves would have some constructive criticism. We also had a different drummer at the time and hadn't really figured our stuff out yet. I would love to go back and watch that show though. Your song “Seventeen” is epic. What were you guys doing at that age? Chris and I were actually running a not-for-profit tie dye t-shirt company called Make A Difference Or Dye Tieing, raising money for a school in Rwanda that we had worked at for a month one summer. Neil was playing in a folk duo called Dogwood and Dahlia, which he tends to get embarrassed about because of his pimply face in their videos, but I think it's really good and you should check it out. Couldn't really tell you what Mikey was up to at 17; in fact I asked him and he responded, "Couldn't tell ya,” so there you have it. What can we find in the band’s backstage rider? Our rider is very basic and cheap to produce yet I can only recall one time we've actually gotten it. We ask for some water, some beer, chips, veggies, and hummus. It was some stock rider that our manager scooped up, he tells us we have to earn a better rider. I think our dream rider would consist of 10 koala cones (candy bags found in Vancouver gas stations), a jar of pickled eggs, raw oysters, and some garlic bread for Mikey. He loves garlic bread. If you had to describe your onstage presence in three words, what would they be? We usually give each other a sloppy wet kiss before the show to really loosen up and allow for ultimate weirdness on stage. Neil also ends up vomiting before a lot of shows. He’s not nervous, he's just so excited that he can't keep anything down. Sometimes Mikey does a DJ set backstage on his phone and we have a dance party. How does the band stay sane and/or entertained while on the road? There’s never a dull moment on the road. I actually dread tour for the sake of laughing too much. Whether we're spending hours scratching lottery tickets or playing endless games of backgammon, we are entertained 100% of the time. Mikey is a very important person to have around, he makes sure we're always laughing. He might be the funniest person I've ever met. What’s the most exciting thing about being in Peach Pit? What do you hope the future holds for the band? I think the most exciting thing about being in Peach Pit is that we're all such close friends. I get to follow my dream and my passion with the three dopest dudes I know, which is pretty rare. I can speak on behalf of the entire band when I say that our hopes for the future of this band is to play in front of as many people in as many different countries as possible and to keep writing honest music that we love to play.